PennsylvAsia: "Lecture: Wang Shu and Lu Wenyu, Amateur Architecture Studio," March 30 in Oakland. 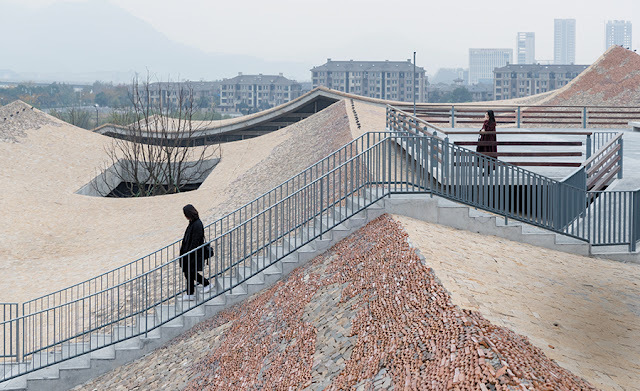 "Lecture: Wang Shu and Lu Wenyu, Amateur Architecture Studio," March 30 in Oakland. Huang Gongwang Museum, via Architectural Record. Wang Shu and Lu Wenyu of Amateur Architecture Studio will present the Association of Collegiate Schools of Architecture Gold Medal Keynote on March 30 in Oakland. Hear Wang Shu, Dean of the Architecture School at China Academy of Art, and Lu Wenyu, his partner and co-founder of the Amateur Architecture Studio, present the Association of Collegiate Schools of Architecture Gold Medal Keynote. Their firm utilizes a knowledge of everyday techniques to adapt and transform materials for contemporary projects. A unique combination of traditional understanding, experimental building tactics, and intensive research defines the studio’s approach. The lecture runs from 5:00 to 6:00 pm at the Carnegie Music Hall in Oakland (map) and is free and open to the public.